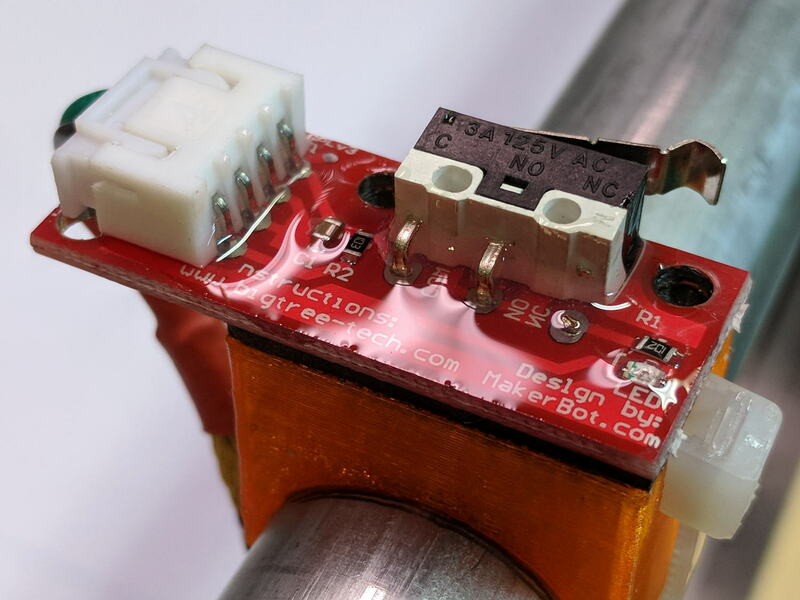 Using 3D printer style endstop switches has the advantage of putting low-pass filters (i.e. caps) at the switches, plus adding LED blinkiness, but it does leave the +5 V and Gnd conductors hanging out in the breeze. After mulling over various enclosures, it occured to me I could just entomb the things in epoxy and be done with it. 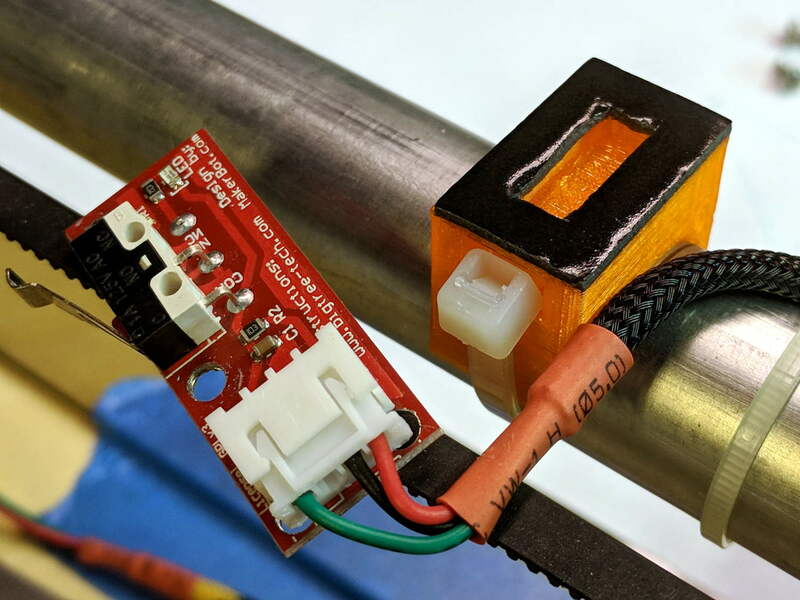 You should use a bit more care than I: the epoxy can creep around the corner of the switch and immobilize the actuator in its relaxed position. Some deft X-Acto knife work solved the problem, but only after firmly smashing the X axis against the nonfunctional switch. Epoxy isn’t a particularly good encapsulant, because it cures hard and tends to crack components off the board during temperature extremes. These boards live in the basement, cost under a buck, and I have plenty of spares, so let’s see what happens. At least it’s now somewhat more difficult to apply a dead short across the Arduino’s power supply, which comes directly from a Raspberry Pi’s USB port. This entry was posted on 2017-12-06, 07:56 and is filed under Electronics Workbench, Machine Shop. You can follow any responses to this entry through RSS 2.0. Both comments and pings are currently closed. I used to mess with RC models. Mixing some glass microbeads in the epoxy makes for a goop that seems to be more forgiving with heat; at least when using a heat gun, it came off without a fight, unlike the straight epoxy. A ground plastic filler should do the same. No idea on sources any more. Man, that silkscreen is sloppy! I think we’re seeing the unholy union of the original Makerbot silkscreen and a Chinese URL (now defunct); it’s a wonder anything lines up. Another batch of those boards has nothing in the URL section, which surely makes it a later revision. I recently botched two boards in similar fashion. My flat flex connectors had an opening in the bottom, so epoxy spread into them and made them next to unusable. Since the flat flex opening on top is less them 20thou there was no way to save the day and I ended up doing all new boards. Similar Chinese service offers same size boards for 5$ with free basic shipping. I have no idea how they make money on these even when you take into account economies of scale, but call me happy. At some point I’ll need a PCB again and, if the schedule allows, I must try those services instead of my own crude DIY process. Thanks for the pointers!